Access to a dentist can be hard even with dental insurance. In Colorado, almost 1 of 5 adults have Medicaid coverage. Less than 12 percent of Colorado licensed dentists take part in Medicaid, due to a variety of factors. Some of those providers only treat a few enrollees while about 5% treat a significant number of Medicaid patients. In the southeastern part of the state, Otero county has a population of 18,698. It is one of Colorado’s five counties with the highest percentage (38.1%) of Medicaid enrollees. Federally Qualified Health Centers (FQHCs) serve low-income patients. They accept Medicaid and offer sliding fee scales for people without insurance. According to the Colorado Health Institute, in underserved areas like Otero County, these clinics are imperative. Charlene Pariera is a registered dental hygienist at La Junta Clinic, Valley Wide Health Systems, Inc. As part of the Colorado Medical-Dental Integration (CO MDI) project, she coordinates care with the medical team. This means patients coming to the clinic for medical visits can receive preventive dental care. Charlene also works with local dentists to link patients to comprehensive dental care, when needed. She met Deanna Donaldson, a La Junta Resident, when Deanna brought her kids in to see Dr. Stella Ocampo. They were diagnosed with strep throat. At the visit, Charlene talked to Deanna about scheduling some dental screenings. When the kids recovered, they returned to the clinic for dental cleanings. Charlene now sees all nine of Deanna’s children for regular preventive care. 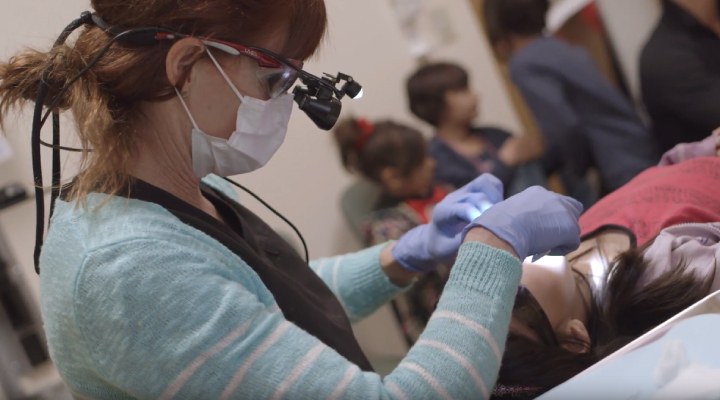 CO MDI hygienists help ease access to care issues in communities across Colorado. In less than two years, sixteen grantees provided more than 20,000 patients. The population was 70% Medicaid. Projects like these break down access to care challenges that Colorado communities face every day. Let us know how we can help support oral health your community. Email us at the Delta Dental of Colorado Foundation.